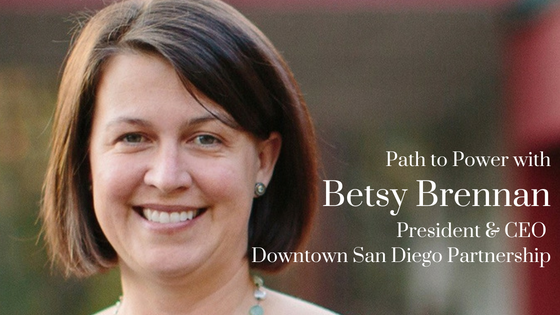 Association of Women in Water, Energy & the Environment (AWWEE) San Diego regional leadership is pleased to welcome Betsy Brennan, recently named President and CEO of the Downtown San Diego Partnership (DSP), for this Path to Power event. With nearly 400 members, DSP supports downtown development, stimulates business and economic growth, and advocates for improvements that enhance the quality of life for Downtown San Diego’s residents, visitors and workers. As President and CEO, Betsy is leading the effort to implement Imagine Downtown, a blueprint for accommodating population and job growth, housing needs and public transportation while promoting and maintaining San Diego’s place as a global power in innovation and technology. Join AWWEE over lunch and coffee to learn more about Betsy Brennan’s proven track record in civic engagements and economic development before DSP and her vision for what is to come in Downtown.